Here's one stat people often cite when talking about the state of U.S. manufacturing: The sector has lost 5 million jobs since 2000. But there's another that's not as well-known: The sector has actually gained about 838,000 jobs since 2010. To be sure, American manufacturing is no longer the powerhouse it once was. Years ago, it was a stable pathway into a middle class life for blue-collar workers with a high school degree. It's since lost jobs due to globalization and new technology. However, that doesn't mean the industry is on life support. Auto sales are strong, leading more firms to manufacture cars and car parts domestically. Clean energy companies are building solar panels and wind turbines here. And the space industry is assembling rocket engines and other parts along the Florida coast and elsewhere. "A lot of challenges remain, but manufacturing is certainly doing a lot better than it was in most of the 2000s and in the Great Recession," said Scott Paul, president of the Alliance for American Manufacturing, an advocacy and research group. The jobs are out there and many pay well, industry insiders say. In fact, some employers say they are having a hard time filling positions. Take Craig Technologies, which owns a 161,000 square-foot machine shop in Cape Canaveral, Florida. Carol Craig, who founded the engineering and technology company in 1999, expanded into manufacturing three years ago because she saw the unmet need. 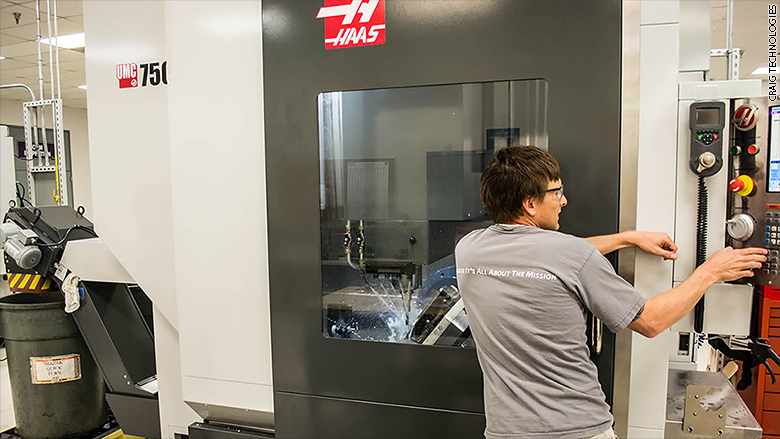 The manufacturing arm, Craig Technologies Aerospace Solutions, builds and repairs complex mechanical and electronic hardware for NASA and the Department of Defense, as well as satellite manufacturers and the commercial aerospace industry. For instance, workers make rocket parts for NASA and its contractors, such as Boeing and Lockheed Martin, as well as satellite parts for companies such as Space Systems Loral and Harris Corporation. It employs 50 skilled workers and Craig wants to triple the payroll over the next two years. Entry-level positions pay about $40,000, while experienced employees can make double that, she said. "Manufacturing is on its way back," said Craig. "The question is how do we get the people in here? We are struggling to fill positions." Workers at Craig Technologies Aerospace Solutions build parts and equipment for NASA and Boeing, among other clients. There's a huge shortage in skilled workers, said Harry Moser, founder of the Reshoring Initiative, which focuses on bringing manufacturing jobs back to the U.S. It's one reason why companies haven't returned more positions to the states, he said. The initiative posts notices on its website about companies expanding production in the U.S. A quick scan found that Whirlpool is adding 50 jobs in Ohio; Moley Magnetics is bringing back more than 40 jobs to New York from Italy, and plastic bottle maker Logoplaste will create 110 jobs in Kansas City, Missouri. Another looming problem: manufacturing workers are aging and up to 3 million are expected to retire over the next decade, Paul said. Many will need to be replaced. Manufacturing jobs today, however, require very different skills than those a generation or two ago. 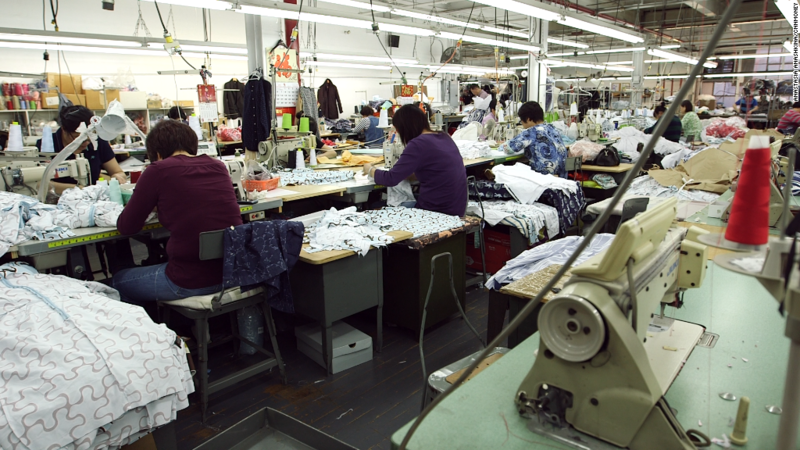 Gone is high-volume, commodity production, such as churning out t-shirts and toys, said James Wall, executive director of National Institute for Metalworking Skills, which sets standards for its industry. Those positions have moved overseas and likely aren't coming back. American manufacturing now involves more precision, technical jobs, such as fabricating airplane parts or artificial knees. Until the mid-2000s, the majority of manufacturing positions required only a high school degree, Paul said. But now, most need advanced training and skills, such as a proficiency in math and problem solving, as well as technical expertise with certain machines. Many require certificates or additional technical training for specific jobs -- such as Computer Numerical Control, in which computers run machine tools such as grinders and lathes. For instance, workers today need to know right angle trigonometry to program a machine to bore a hole into a metal sheet, Wall said. Community colleges and private training centers are aiming to fill the gaps. Companies are increasingly working with local colleges to create courses that prepare students for available jobs. Some high schools are now even developing manufacturing skills programs for the first time in years, Wall said. Craig Technologies is in touch with area schools, providing internships and tours to students interested in manufacturing jobs. And the local high school teaches some relevant technical courses, such as SolidWorks, a computer-aided design software program. All these efforts are aimed at building a pipeline of skilled workers. "The average American has no idea how robust the manufacturing sector has been and is going to be," Wall said. "We just need to get people the skills to take advantage of it."